Chased, again, with Jonathan Williamson, Jeremy Degenhart and Alec Scholten. We stayed in Emporia the night before and our target area for the day was somewhere along the KS/OK border east of I-35, including the dreaded Osage County. Nevertheless, we were ready to roll and departed the hotel around 11am and bolted down the turnpike. We were originally watching a remnant outflow boundary that was drifting north as a possible area for initiation and increased tornadic potential. As we continued south it became harder and harder to see that boundary on satellite so we turned to watching for subtle wind shifts in the METAR data. SPC had a 15% hatched risk area for tornadoes on the day expecting initiation along the dryline and cold front later in the afternoon with cells staying discrete and tornado potential ramping up quickly as the afternoon turned to evening. We got down to the US-166 corridor near South Haven and figured this area would be a good place to sit, so we started looking to top off our tanks to be ready. 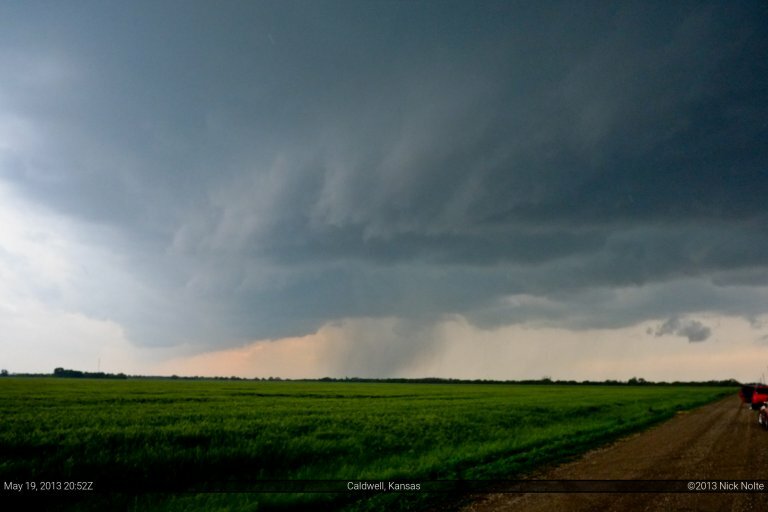 A Cu field started to develop east of the dryline from Central Kansas into Central Oklahoma and shortly after we arrived in Arkansas City the tornado watch was issued. Shortly after the watch was issued, towers started going up in Harper County southwest of Wichita so we moseyed north to check them out with the intention of dropping back south if anything developed south of the border. 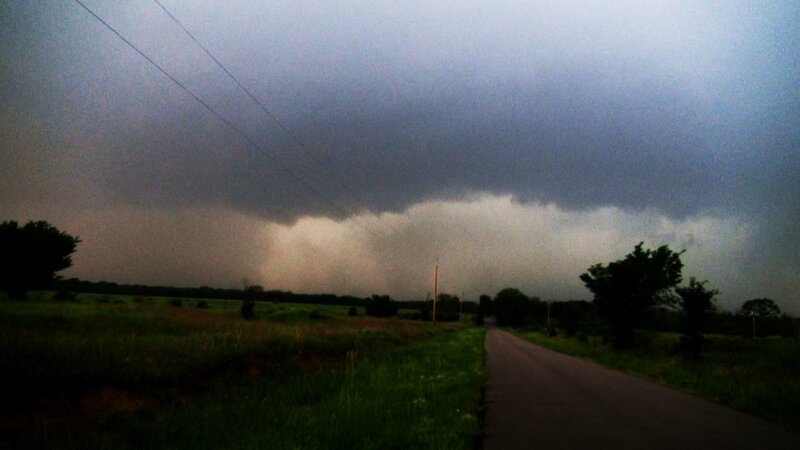 Eventually we got a decent looking storm near Caldwell that looked like it was getting organized. There are a couple of LSRs from shortly after this of an actual touchdown, but we must have missed it while we were re-positioning since we were behind it at that point. We kept up with it for a bit more but eventually the whole area started to line out. 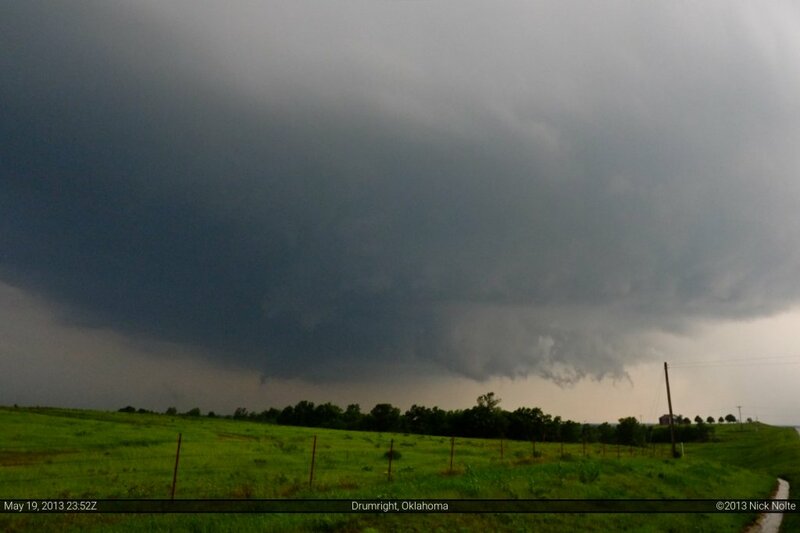 It was at this time we looked at the southern storms in Oklahoma as they started going tornado warned. We made the decision to head south to try and catch up with those. Eventually we got separated when I had to stop when one of my antennas blew off my car, so I ended up heading for the intercept on my own. 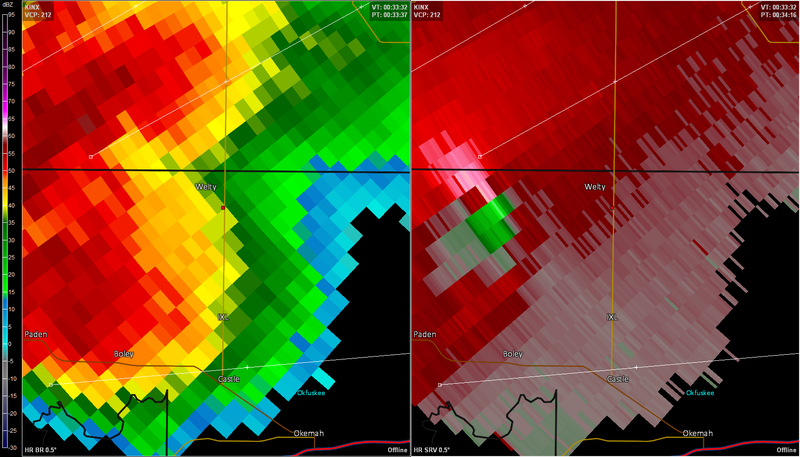 I hit the 412 turnpike trying to put myself in position to intercept the second storm in the line near Drumright. I had to core punch from the north, but managed to beat the mesocyclone to route 33 where I was able to blast east to get in front of the storm. Eventually this storm died out and I had to make a play on tail end charlie that near Prague with a tornado warning. About a mile south of Welty, I pulled off on a county road and got a view of the rain wrapped tornado with the RFD slot wrapped around it. I wasn’t 100% sure that’s what I was seeing at the time, but later surveys and video verifies I caught the last couple minutes of the Prague-Welty tornado. Just a few minutes after this photo the tornado disspiated and I bailed south to see if the new development at tail end charlie would do anything. It was a complete HP mess at this point and there was a huge chaser convergence in Castle, so I continued east to find the next north road to keep up with the storm in case anything organized. I followed it on OK-56 through Okfuskee and Lake Okmulgee Park where it had a nice wall cloud on it, but eventually looked like it was starting to lose organization, so I called the chase and met back up with the guys in Okmulgee where we would crash for the night and rest up for the big chase day the following day.